Increase your Sales instantly by using Sales Data Visualizer. RT SalesMap gives you a clean, transparent, and uncomplicated visual representation of your Accounts, Leads, and Contacts using Google’s powerful web browser mapping software right on your Sugar instance. Track and locate your Sugar Leads, Accounts and Contacts on the go! Instead of searching through your database, look at your customers and prospects visually. SalesMap empowers to make decisions on who to visit out in the field, and manages the ability to see their customer base visually. Click here for a visual demonstration. RT SalesMap picks records from the three modules i.e. Accounts, Contacts and Leads and displays them on Google map. The positioning of the results is determined by the addresses associated with the Sugar records. Customize your search as per your need. RT SalesMap offers custom search criteria to provide best matching results to view nearby Leads/Accounts/Contacts . You can filter your records by selecting different fields and their values. Using custom search criteria, you can save module specific search for future use. It saves lots of time as well. Sometimes, you may find dummy addresses recorded in your system. RT SalesMap helps you bypass this issue. It keeps record of geocoded and non-geocoded addresses. Geocoded addresses represent valid addresses with defined latitude and longitude coordinates. Non-Geocoded records, on the other hand, are the invalid addresses with no latitude and longitude coordinates whatsoever. You can view how many valid and invalid records are showing in your system through RT SalesMap. 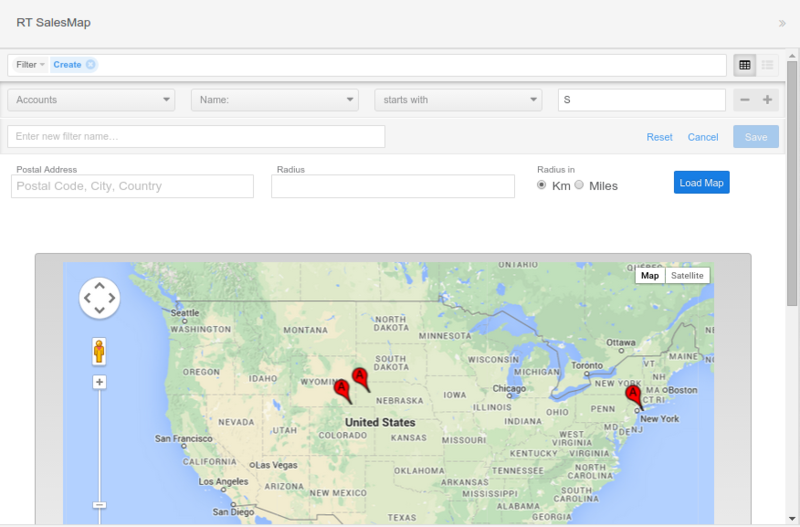 Want to view the details of your selected records on RT SalesMap? The plugin has an option that opens a popup showing the name of the record when a pin is clicked. The popup window then redirects the user to the detailed view of that particular record. RT SalesMap is a route planner for your sales team. It integrates GPS service to help you find the best route from source to the destination. The source is the address of the logged in user. By clicking on the directions window, you see two pins, one at the source point and the other at the destination. RT SalesMap shows all possible routes between the given locations. One map loading call is free per day. So once the map has been loaded the map will not be able to re-render until the next day. Users must upgrade their APIs to Premium plan in order to get RT SalesMap to work properly. for more information you can visit the New Policy web page. What are you waiting for? Save your time and effort and start RT SalesMap trial today! Click on the View Pricing button below and get started. Ciick on the following links to have a quick look at RT SalesMap User Guides and installation Guides . You can download the RT SalesMap User Guides and installation Guides by opening the following links and then clicking on the download button. Click here to see the version history of RT SalesMap Plugin. Click here to see the Frequently asked questions of of RT SalesMap Plugin. Keep track of your remote meetings in Sugar® CE or SuiteCRM? See your meetings and plan your routes visually by using this map add-on. Display all of your meetings on a map right from your Calendar.